CtrlS Review 2019: Is CtrlS a Good Hosting? CtrlS is a web services provider with a qualified and award-winning staff boasting a number of international partnerships. They have some of the most secure servers in multiple locations offering advanced monitoring. They are easy to reach both through the website as well as through social media. CtrlS is a web hosting service provider based in India, which came into existence in 2007. 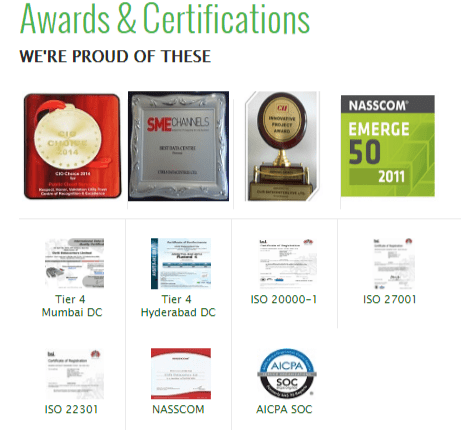 They proudly display a number of certifications and awards on their website which clearly showcases their expertise in the area. They are partnered with leading IT firms around the world including Microsoft, Oracle, and cPanel. They provide IT management services of the highest quality. They offer their services and products in English but are limited to only a few regions, which include India, USA, UAE, KSA, Qatar, Bahrain, Oman, Kuwait, Srilanka, Australia, Singapore, Indonesia, Philippines, Malaysia, and New Zealand. CtrlS offers both Cloud Server and Dedicated Server. The dedicated server services are based in India as well as in the UAE. These services have advanced monitoring allowing you to monitor nearly 200 applications with over 3000 metrics. They are one of the most secure servers in the world offering important security features like Log Analyzer and SIEM. Their dedicated server in the UAE offers 500GB bandwidth while the one in India offers only 250GB. The different plans offer different bandwidth, memory, number of IP addresses as well as the Operating System. You can choose your own hardware and software. You just have to tell them your specifications and they’ll oblige. With the help of the largest Tier 4 datacentre in Asia, you are guaranteed a 99.995% uptime as well as SLA guarantees. There are several backup services that you can utilize including mobile data backup and direct backup to CtrlS. The backup is created on redundant hard-disk based solutions so that your data is as safe as possible. CtrlS has only one option for payment and that is a monthly fee for the services. The prices seem reasonable and vary slightly for Linux and Windows-based servers. They also offer free one-month cloud services but it is unclear from their website what features you will be able to use during that free month. CtrlS can be contacted at any of their five offices in India or at the one in the UAE. It is much easier to contact them through the contact form on the website. With their Pay-per-Ticket feature, you don’t have to pay a fixed amount for monthly support – you can instead opt for requesting support only when you really need it. I also tried their live support which seemed automated at first. However, my query was answered on the second attempt so there was definitely a human at the other end. They are quite active on social media which is another way to quickly get in touch with them. CtrlS is the perfect solution for large and medium businesses. They offer their services outside India as well and are only too pleased to cater to your individual needs. Wondering how CtrlS stacks up against other Web Hosting companies? Enter any other Web Hosting company and we will give you a side-by-side comparison.